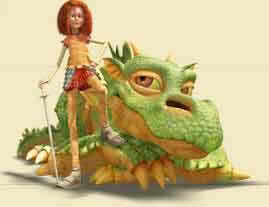 Recently I discovered a cool children’s show called ‘Jane and the Dragon’. Naturally I loved the medieval/fantasy setting, I liked the gaming style animation of the characters and the pencil shaded look of the backgrounds and what REALLY sold me (and this is no surprise to anyone who knows me well) is the main character is a girl training to be a knight. I’m currently hunting down the books – they appear to be out of print annoyingly enough but there are many online services designed to help me circumvent THAT issue – partially for my own guilty pleasure but more so for Xander. Why? Because until recently I had no idea how little the realms of fantasy (among other things) have few positive female role models. Personally it hasn’t been until entering the blogosphere that I even realised this. Perhaps I have always had the good fortune of consistently picking up the right kinds of books where women were strong and brave and bold – often outside of the confines of their usual roles, but sometimes from within those restrictions as well. More likely it is the fact I’ve always been a tomboy and as such gender roles were by and large ignored by me. Some of the posts I read make me roll my eyes at the melodrama, but some have such clever points that I can’t help but feel shocked. So why then do I care about my son reading stories where women are positive role models? That is because I want him to one day be talking with a girl, disheartened she will tell him ‘I can’t be a *Insert role here* because I’m a girl’ and his response will be a look of bewilderment followed by a reply of ‘who on earth told you that load of balderdash? Of course you can’. Okay, maybe he won’t say balderdash, but what more could a mother want to hear? Xander already has access to some great tales of feminine strength that are brilliantly disguised as ‘normal’ fun stories ranging from comics to books and even a few video games (there’s a sad few of that last format). He even has several real life role models (of course I count myself, but there are a couple of others as well who I hope can stay in his life for him to both learn from and love). So the future looks promising for my sweet little man and with some luck for that poor misguided girl too. If you’re interested you may like to read this nice letter to the girls of the world. picture from the official Jane and the Dragon website. I adore Jane and the Dragon, she is amazing.